Mon, Jan 15, 2018, 08:10 pm SL Time, ColomboPage News Desk, Sri Lanka. 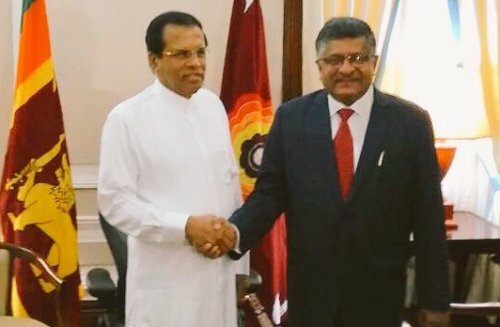 Jan 15, Colombo: Sri Lanka and India today signed a Memorandum of Understanding for cooperation in IT and Electronics to enhance Digital Literacy and e-governance during the visit of India's Minister of Law & Justice and Electronics & Information Technology Ravi Shankar Prasad. 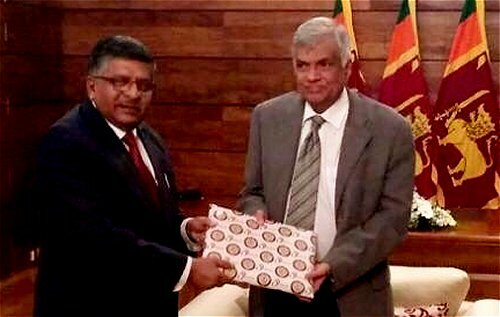 The Indian Minister visiting Sri Lanka from 14-17 January today called on President Maithripala Sirisena, Prime Minister Ranil Wickremesinghe. Indian Minister held detailed discussions on furthering bilateral cooperation in ICT sector with the Telecommunication and Digital Infrastructure Harin Fernando. Following discussions, the two ministers signed a MoU for cooperation in IT & Electronics. The scope of MoU inter alia includes e-Governance, m-Governance, e-Public Services Delivery including e-learning, tele-medicine, cyber security etc. Minister Ravi Shankar Prasad noted India's commitment to share the fruits of the ambitious Digital India program with Government of Sri Lanka. He underlined the importance of digital inclusion, the need to use IT to uplift the people at the grassroot level, and the need for benefits of IT to percolate to the neediest. A pilot program on E-Office, an electronic platform developed by National Informatics Centre of India (NIC), which enables conduct of office procedures electronically was launched in Sri Lanka. The E-office platform is widely used in government offices in India and has transformed the government functioning to a more efficient and transparent mode, removing the need for processing/storage of conventional paper files. A knowledge partnership between National Knowledge Network (NKN) of India and Lanka Education And Research Network (LEARN) of Sri Lanka was also launched. This would enable secure and reliable connectivity between educational institutions of India and Sri Lanka under an Ultra High Bandwidth network. In one of its kind, several Universities in India and Sri Lanka were linked through a Digital Video Conference during the launch. Sri Lankan Universities would now be able to connect with Educational Institutions in Europe also through the network. Top educational institutions in India & Sri Lanka are now connected through NKN such as IIT, Delhi, IISC, Bengaluru, JIPMER, Puducherry, MSU & MKU from India & Open University, Universities of Jayewardenepura, Ruhuna, Jaffna, Moratuwa, Rajarata and Eastern University from Sri Lanka. India remains committed to offer all assistance to Sri Lanka, based on Sri Lanka's priorities and requirements, the High Commission of India in Colombo said.